Bangkok has a sparkling metro system, river ferries and even a network of canals. But it still has the worst evening rush hour traffic in the world. 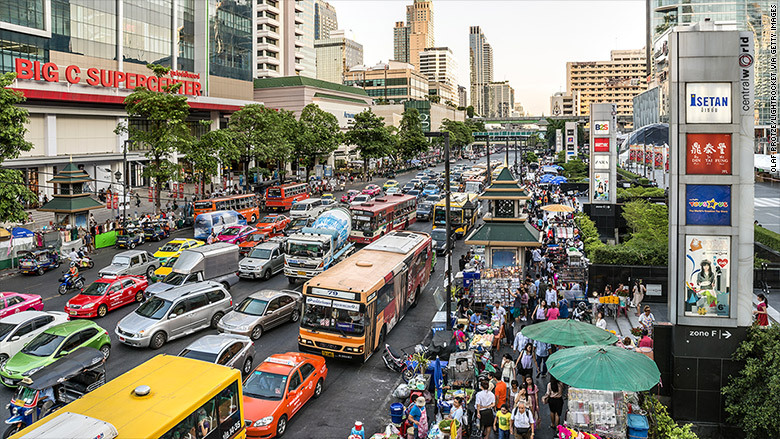 Journey times more than double in Thailand's capital city during the evening commute, according to GPS manufacturer TomTom. "It's pretty extreme," Nick Cohn, senior traffic expert at TomTom, said of the city's road delays. It might get even worse, especially as the country's middle class continues to grow. "People just wanna drive because it's kind of a status symbol," Cohn said. The TomTom index is based on data from vehicles driving across each city's road network. The evening rush hour ranking is based on time added to a congestion-free journey of 30 minutes.